The following article first appeared in AdvocateDaily.com, March, 2019. While U.S. taxpayers living in Canada might be tempted to hire any preparer to file their tax return south of the border, a qualified U.S. tax adviser can help them navigate this complex and constantly evolving landscape and ensure their personal and business objectives are met, Oakville-based U.S. tax attorney (NY, DC) Alexey Manasuev tells AdvocateDaily.com. 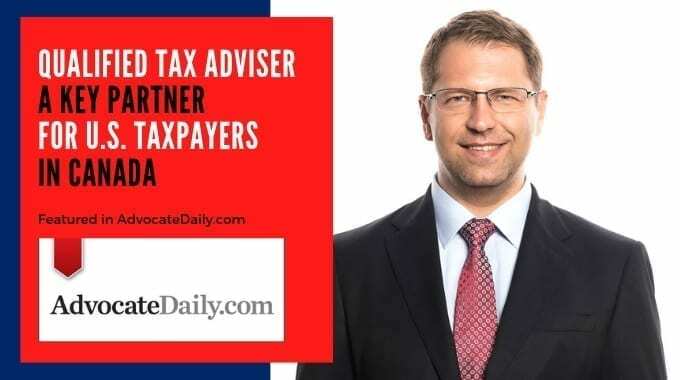 A qualified U.S. tax adviser, explains Manasuev, principal of U.S. Tax IQ, is an individual who can represent taxpayers before the IRS. Currently, this can be a U.S. tax attorney, a Certified Public Accountant (CPA), or an enrolled agent. Although the U.S. tax system may seem similar to Canada’s, and a question may appear simple at first, he says, a “quick question” often leads to a series of matters that need to be resolved and that hinge on several factors. These issues benefit from the analysis and experience of a qualified U.S. tax adviser. “Everyone has their own objectives, and you need to consider the income tax side of things, the U.S. estate and gift tax, any non-tax considerations, such as limitation of liability, as well as the cost of maintaining the structure and giving life to any business entities that are formed or created as a result of that structuring,” says Manasuev …. Free Webinar - 2018 Tax Season Review: Have You Forgotten Something? Free Webinar - Under Fire! What to Do if You Are Audited by the IRS? Free Webinar - The ABC of Tax and Life Balance - How Life Events Affect Your Taxes? Oh, Canada! Do Canadians Really Have to File U.S. Tax Returns in 2019? Need Help with Your U.S. Taxes? Contact Our Trusted Advisors Today. U.S. TAX IQ is a tax boutique firm specializing in U.S. and international tax. Our experienced U.S. tax and international tax advisors offer effective and practical U.S. tax and cross-border tax consulting, planning, compliance, and tax return preparation services.